Kay Bojesen monkeys, zebra and much more. Buy online here. Silversmith and designer Kay Bojesen could be something special. He could give the tree life, and he became world famous for creating wooden animals with soul, humor and a twinkle in the eye. Kay Bojesen has with more than 2000 pieces of handicrafts on his conscience been one of the 1900s most productive Danish craftsmen. 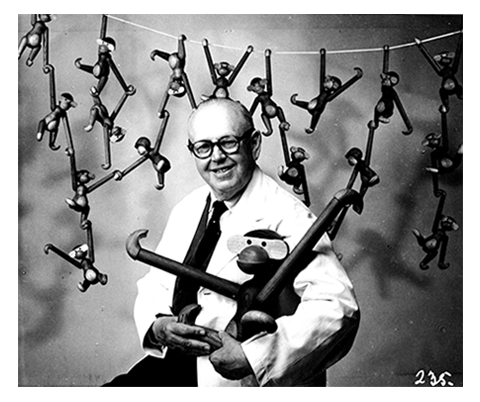 He is best known for his playful cheerful monkeys, livgardister and other wooden animals, but his great production also includes jewelry, cutlery, tea pots and silver cups. Kay Bojesen graduated as a silversmith in 1910 after he had completed his apprenticeship with the silversmith Georg Jensen. As one of the first in the Danish handicrafts, he let himself be inspired by functionalism, and he was among the initiators of the "Den Permanente" - a business and a showcase, which for decades represented the best of Danish and Scandinavian design. 1919 marked the beginning of a new era for Kay Bojesen. He was married and had a son, Otto. It helped to boost Kay Bojesen's fascination with children, toys and wood and brought back memories of his own childhood, where his father (publisher Ernst Bojesen - publisher of including "The Octopus") carving wooden figures to him and bl. a. encouraged his children to the ingenuity, imagination and high spirits.